The powerful and complex Huari Empire flourished from A.D. 750 to 1000. The empire was centered near the modern city of Ayacucho, Peru, and included a vast region of conquered coastal and highland lands across Peru. It's thought that the Huari, rather than force conquered peoples to submit to their religion, integrated local religions into an overarching ideology. The Huari were the first to use terraced agriculture in this hemisphere. They were sophisticated artists. Their textiles are considered to be some of the finest works of art from any era. Huari textiles were manufactured from camelid and cotton fibers. Ceramics and textiles include common iconography. The staff god, an anthropomorphic figure with a staff in each hand and a rayed corona and flanked by profiled figures, is often depicted, as is the psychotropic plant, Anadenanthera colubrina. Other motifs include, among other things, a deity with a rayed face and winged figures bearing staffs, fire-making using a fire-drill, and scenes of musicians playing various instruments (men with panpipes, a deer-headed trumpet, or a whistle and women with drums). 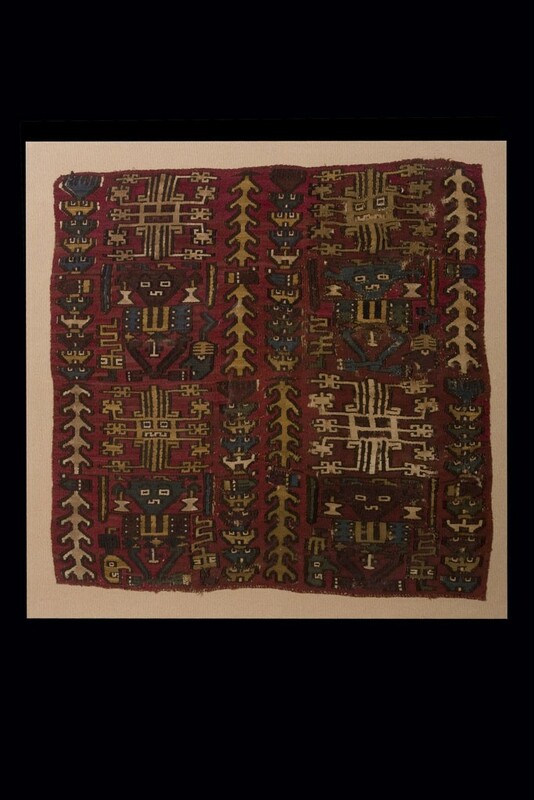 These likely depict Huari ceremonial practice and the textiles were probably used in a similar ritual context. 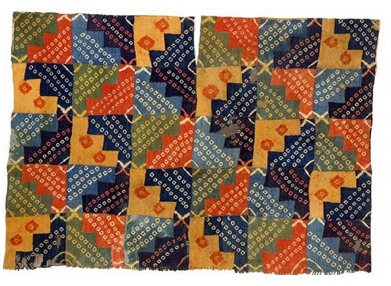 According to the Textile Museum, Huari tunics are among the most finely-woven textiles in the world. One tunic may comprise six to nine miles of very fine yarn! 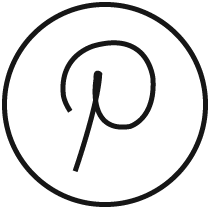 Thread count was 150 to 200 per inch, which is comparable to industrially produced fabrics of today. Some pieces were created with small, individually dyed and patterned pieces of cloth sewn together in intricate patterns. This indicates to scholars that a specialized workforce of spinners and weavers, likely under the patronage of the state or religious establishment, was in place. Please see my post about weaving as an induction method here. Deposits of smashed ceramics and evidence of large-scale corn beer brewing has been found by archaeologists. The seeds of Anadenanthera colubrina, known as a hallucinogenic substance in use during the time of the Huari Empire, have been found in association with the vessels and beer evidence. Some scholars believe the beer was laced with the hallucinogenic substance. It is assumed that the hallucinogen was used ritually. 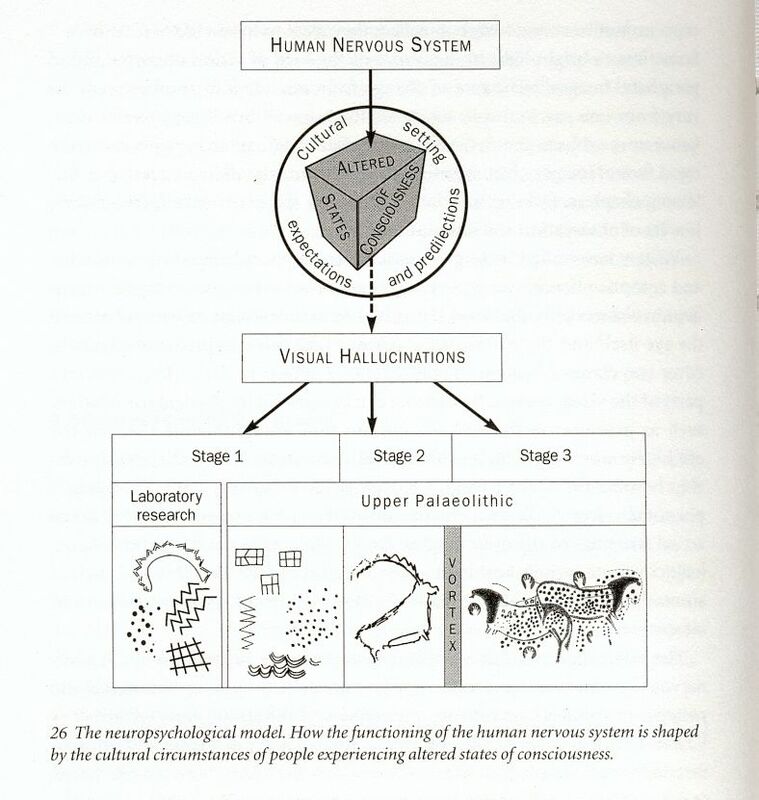 Iconographic studies often provide evidence to interpret ritual activities of archaeologically known cultures. Recent excavations at the site of Conchopata near Ayacucho, Peru, led to a re-analysis of the ritual behavior of Middle Horizon (A.D. 750-1000) Wari society. The identification of a hallucinogenic plant design, Anadenanthera colubrina, depicted on Conchopata offering pottery contributes a crucial understanding of a previously unknown artistic icon. 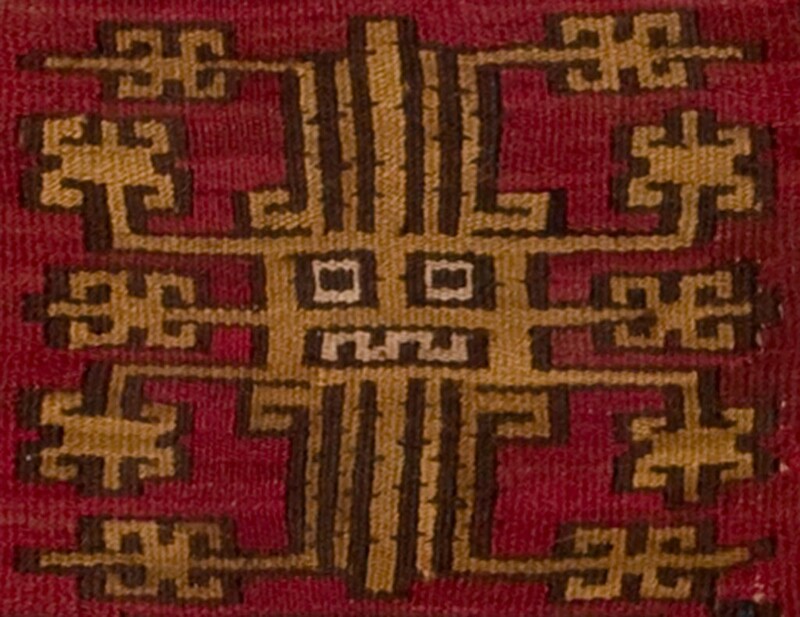 This icon was discerned as depicted in various abstract renditions on Middle Horizon textiles, snuff paraphernalia, ceramics, and stone sculpture, including the Gate of the Sun at Tiwanaku, Bolivia. Based on historic and ethnographic evidence, the plant's prehistoric use as a hallucinogen is discussed with regard to suggested chicha drinking ceremonies, and the transitional role of Wari leaders from shamans to priests. 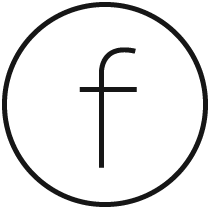 Stage 2 imagery: We're looking for an image that appears to be transitional between entoptic and fully cultural. Sample 2 depicts the emergence of the staff god from a variety of entoptic motifs including a lattice, nested circles, nested lines, repeated ilnes, dots and a radial. Sample 3 shows a detail of a radial motif turning into a deity. Stage 3 imagery: Fully iconic and culturally biased imagery can be seen in Sample 4. This tapestry shows naturalistic profile gods. Vortex imagery: Sample 5 has a series of spirals, which represent the vortex experienced between Stages 2 and 3 of ASC. According to some scholars, the realm of the living and the realm of the dead are depicted on the textiles by various means, including geometric motifs. Conklin interprets Tiwanaku and Huari tunics in relation to the Sun Gate, an architectural feature at a Tiwanaku site that appears to reflect a common ideology. On one side of the Sun Gate is a series of multiple lines that surround the portal and emanate upward from a base line. An analysis of these lines indicates that the spacing replicates those found on horizontal rows of figures on Huari tunics. Often, the lines are present without the polymorphic figures, as if "the geometry carrid the full meaning withiout its inhabiting polymorphic flying figures" (Conklin). The N/S axis of their cosmic grid had terminal points, perhaps since their sun, broadly associated with heat and life, is associated with the northern direction and the southern direction is associated with cold and death. But the E/W axis in these Tiwanaku graphics proceeded continuously and regularly like the days and nights and like time in general. 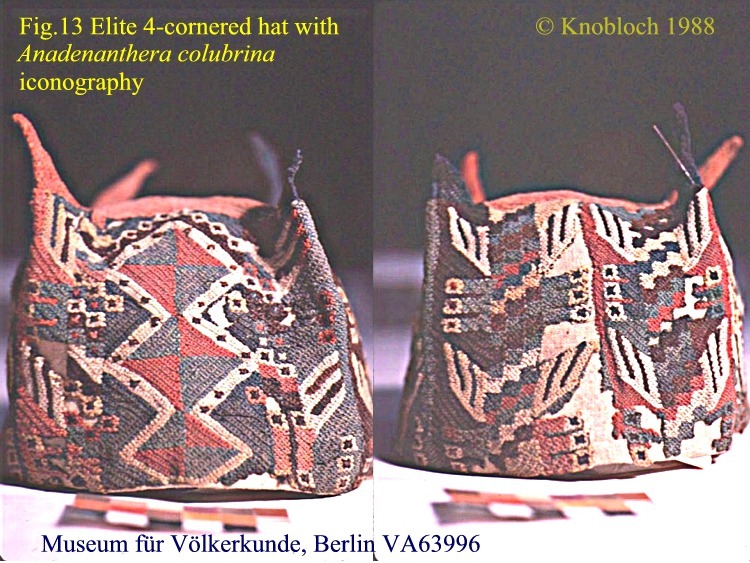 World of the living: The Anadenthera colubrina, depicted as a series of lines emanating from a central line, is visible on a vast number of textile items, as in this hat below. The plant is from the earthly realm, and serves as a symbolic ladder to the spirit realm. 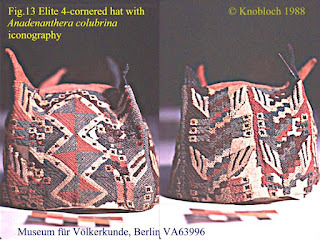 Four-cornered Huari hat from Knobloch's article. 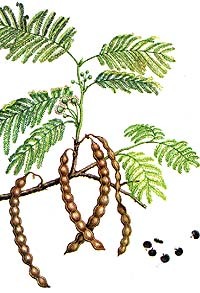 Patricia Knobloch's great article on the Huari's depictions of Anadenanthera colubrina. World of the dead: Figures that have human and puma attributes, the staff gods, the feline profile gods, the flying jaguars, the list goes on! See samples above. Passage or tunnel (In many (or most) cases, the tunnel should be accessible only to the shaman/celebrant and the decedent, as it may considered too risky for laypeople to make the journey). See sample 5 above. Obviously, not a whole lot can be known about the traditions surrounding the production of textiles during the Huari period, beyond what is depicted in artworks and whatever can be extrapolated through careful analysis of the construction of surviving pieces. Huari weavers conceived of the tunic as having two parts, and they constructed them separately although this is obviously unnecessary. The two separately constructed parts were then joined together, leaving arm holes and a neck slot but with a nearly invisible join to create the complete rectangular textile. 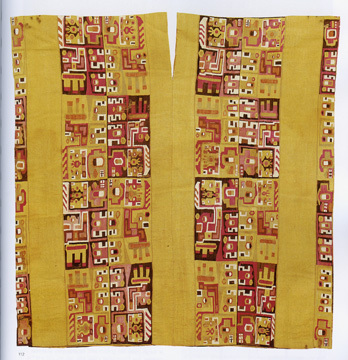 These two parts of a Huari tunic -- created as equals, a left and a right, later joined together -- were seemingly an Andean dualistic refrain. 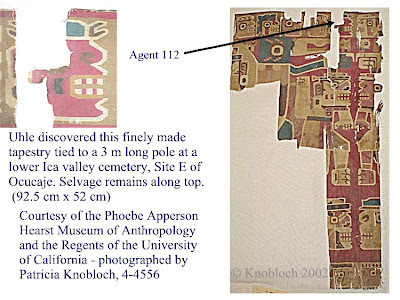 Elaborate textiles were found in graves. At the Temple of Pachacamac, Uhle excavated numerous Middle Horizon graves. One of the oldest graves, H7c, underlay the last Middle Horizon reconstruction phase of the temple of Pachacamac and contained many vessels and a badly damaged large textile with an elaborate scene (Fig.19-21) (Uhle 1903: Fig.18; Pl.4, Figs.1-3; Pl.5, Figs.1,9,10,11). The artist documented an event in which a central figure held a tumi knife and trophy head and was flanked on either side by attendants. Two breaks in the cloth and additional fragments suggest that there may have been other attendant figures. Along the right edge four other individuals were painted, two full-bodied and two bodiless. ... Perhaps these individuals, by wearing symbols of mythical power, established and sustained an elite authority over this new populace as Wari political power waned. The most ubiquitous textile by far has been in the form of tunics. Most scholars believe that rather than serving as environmental protection (i.e., clothing), these were worn as symbols or a type of uniform. Hundreds of these tunics have been found, and all have been of roughly equal quality and elegance. There does not seem to be a hierarchy reflected in these textiles. In other words, no bedazzled tunics have been found in association with kingly or queenly graves. All the tunics are the same or similar, even in size. This doesn't indicate an egalitarian society, necessarily, especially in light of the fact that the large-scale construction is traditionally thought to require an authority-driven cultural system. 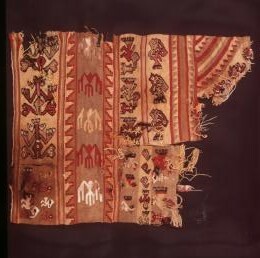 The earliest Huari textiles known are long rectangular cloths, with ceremonial iconography associated with 16 major deities. These are thought to have served some ritual purpose, perhaps as altar cloths or prayer rugs. 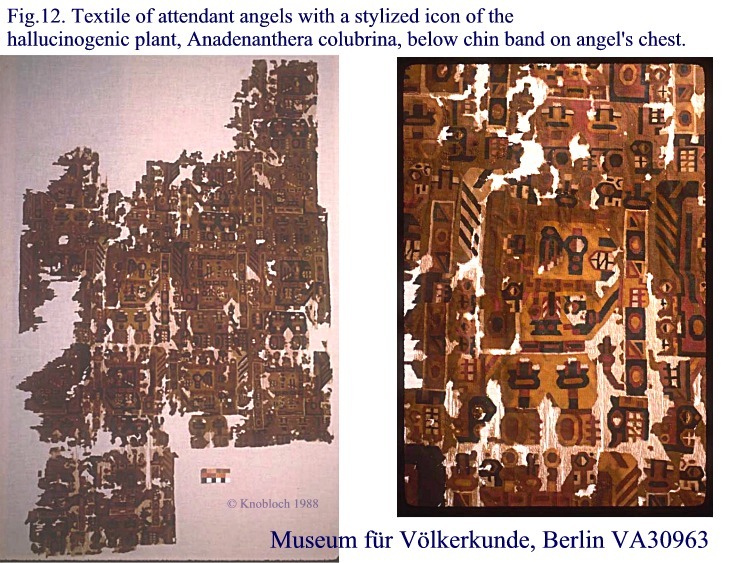 In his comparison of Huari tunics with Tiwanaku tunics, Conklin discusses depictions of flying deities that place the wearer in the center of the cosmos. Conklin's article here! Especially in Huari tunic conventions, multiple bands of the figures that vary in size are used, with the smallest on the lateral sides of the tunic and the largest in the center of the tunic (Fig. 18). These bands of figures seem to be organized into vanishing horizons in a logarithmic-like progression of horizontally flying figures. Huari fragment from the Powerhouse Museum Collection. If we think of the wearer as being encompassed by his tunic that hangs around him, he would conceive of it as a formation of flying figures that is extending out from him, specifically out from his head-centered body. Remembering that the condensation toward the horizon occurs on the outside of the tunic, he would then perceive the figures as flying horizontally on either side of him, but receding toward the surrounding horizon. His tunic then becomes a kind of cosmic carpet in which he is the central participant. If we consider the tunic wearer to have been a participant in a Tiwanaku ceremony, then this image from his tunic would seem to be resonant with his image of the cosmos that would have been surrounding him. 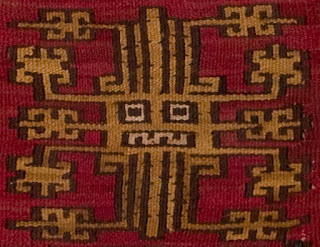 Perhaps what would have come into this Huari tunic wearer’s mind, then, is not at all our museum image of these tunics as colorful abstractions, but instead would be the iconic content of the image that he knew so well - the horizontally flying mythical figures who seem to occupy the cosmos who fly horizontally from the left and the right toward a toward a centerline and, who seemto recede in rows toward the horizon. 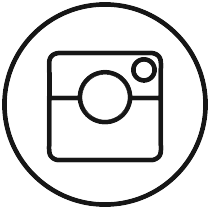 This image might have seemed to the wearer to be a guide to the world around him suggesting that he was a part of a cosmos-wide event. 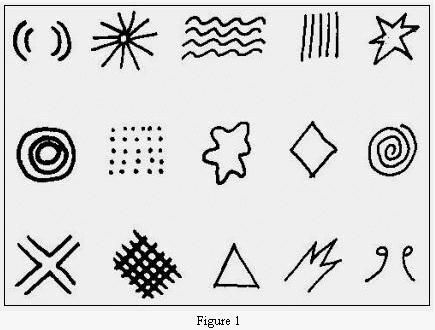 There are depictions from all three stages of ASC, a known inductive element, and ritual associations with these textiles. In addition, motifs from the various cosmic realms are present. Although traditions surrounding the production of these textiles are essentially unknown, it may be comfortably said that these textiles reflect a neurologically-generated tiered cosmos.